Saw this today while trolling across the Bandai Macross Frontier site. 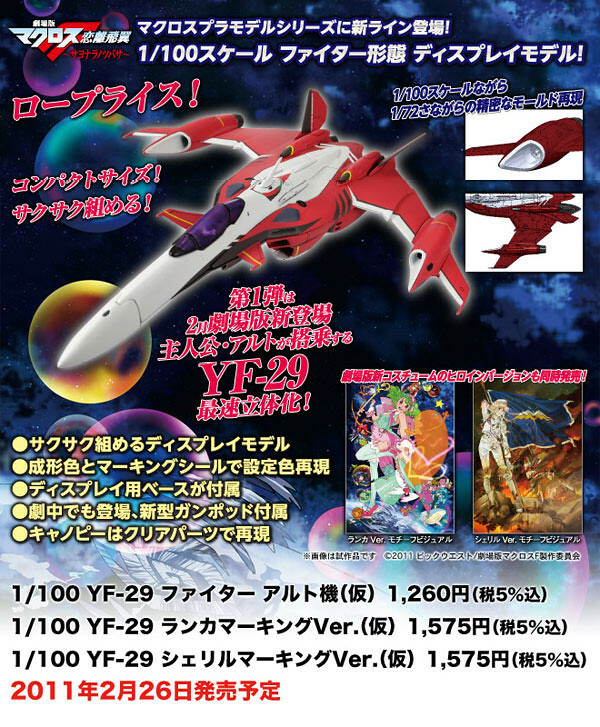 Its an announcement for the 1/100 YF-29 (fighter mode) Alto version model kit. Haven't read it fully but at first pass it seems to say that its based off the 1/72 molds of the VF-25. There seems to be 3 version available, Fighter Mode Alto then 1 with Ranka markings and another with Sheryl rankings. Looks like this will just be in fighter mode and not gerwalk and battroid. Speaking of Macross Frontier, I wonder when part II of the Macross Frontier movie will come out?, can't wait to see that, although I have to confess that I wasn't pleased with the Macross Frontier movie. Another thing I have to point out, judging from the design of the YF-29 (front swept wing and canard) plus the designation, it looks like Shoji Kawamori is paying homage to the YF-19 of Isamu Dyson from Macross Plus.